As the holidays wind down, homeowners tend to look ahead to projects they want to tackle in the new year. After all, January is often the perfect time to organize a plan around a major remodel or just let go of the past by upgrading outdated elements. Whether you plan to big or small, here are our predictions for most popular remodeling projects next year. If you’re not looking to tackle these projects yourself, contact us about our handyman services at an affordable price. Kitchens continue to be the hub of a home and we don’t see that changing for 2018. Likewise, bathrooms have been a big focus for years now. However, not everyone is looking for a massive overhaul of what they have. Many homeowners find a more modest kitchen or bathroom remodel takes less time and money but still makes a major impact on the space. Plus, both remodels tend to recoup much of the cost, which is why they are at the top of many homeowners’ lists. A lot of homeowners are looking to add or replace entry doors as well as garage doors. Both can create a whole new look for the exterior of a home and tend to be easier on the wallet than many other home projects. Over the past couple of years, outdoor spaces have really take off in popularity. It’s no wonder then that homeowners are looking to increase the possibility of an outdoor haven by adding or replacing wood decks. Add a few built in benches, some plants, and cozy furniture and you’ve practically added another whole room! Ready to welcome 2018 in style? Homeowners looking to add modern elements may just need to refresh rather than remodel. Adding new lighting or plumbing fixtures, switching knobs and pulls, swapping ceiling fans or installing some shiplap can bring a home from out of date to completely current with minimal time and money needed. If you are planning a remodeling project for next year, big or small, give us a call so you can benefit from the guidance, experience and expertise of a professional! 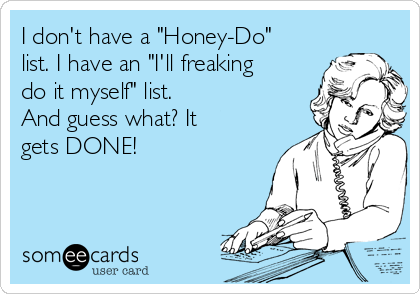 What Is A Honey Do List? There appears to be no specific origin for the term “honey do list,” though today it is commonly known as a cute way of asking a spouse or partner to help with home projects. Most homeowners have long lists of items that need to be fixed or tended to and appreciate all the help they can get in dividing these tasks. Here are 10 of the most common items found on a honey do list. Plumbing items– Leaky faucets and clogged drains are common issues among homeowners. Other things that fall into the plumbing category: replacing the hardware on toilet tanks, replacing toilet seats and covers, upgrading shower heads, installing new toilets and repairing garbage disposals. Electrical issues – Many lists contain electrical work that (on the surface at least) can seem simple enough: replacing ceiling fans, light fixtures or adding dimmer switches. Preparing the home for a new season –Each season usually brings several home improvement opportunities. Is it time to inspect for drafts around doors and windows, install storm windows, or give your heating system a tune-up? Caulking – Sometimes caulking is necessary when preparing the home for a new season, but don’t forget around the tub or shower too. As homes settle and age, caulking is a constant maintenance job that must be revisited. Landscaping – Fall and spring are the most common times to invest in landscaping and gardening projects. These projects can run both big (think building a retaining wall) and small (planting new shrubs). Painting – Whether it’s touching up trim or tackling a whole room, painting is often on a honey do list. This can include doors, windows, or even the exterior of the house. Repair/patch work – Sometimes there’s damage to the drywall, or broken tiles, or maybe beat-up baseboards. Over time, homes get scraped and roughed-up and just need a little extra attention to be brought back to their original shape. Fix the sticks and squeaks – Floors, doors, and cabinets tend to do a lot of work. Inevitably, hinges get loose or need oil and floors grow gaps and worn-out spots. Cosmetic changes – Lots of honey do lists tackle simple cosmetic changes, like replacing the hardware on cabinets and doors. DIY projects – Homeowners often get creative with home improvement jobs like shelving and molding that can enhance a home’s overall function and appeal. For those who love tackling a honey do list, here’s a clever way to hand out coupons for your projects. For those who might want help tackling an ever-growing list, we’re here to help. Let us take care of your handyman needs so you can enjoy your free time! Basements are an incredible opportunity for increased space in a home. While unfinished ones often become an extra spot for storage, finished basements can be used extensively for other purposes. Though only major renovations will increase property value, many homeowners find the potential in basements incredibly appealing. Here are 3 of the most common ways people fix them up. For homeowners looking to add another bedroom, the basement is a great option. In order for the space to be considered an actual bedroom, you need to check your town’s specific requirements, which may include closets and egress. However, even without major repairs you can improve the space and convert it into a quiet retreat for guests or family members. Easy ways to increase the coziness include covering the walls and floors and adding soft layers like rugs and curtains. You can potentially skip the drywall altogether and simply paint the exposed ceiling and cinderblocks to create a cohesive and pleasing visual. Need examples? Try these out of the box and inexpensive ideas for a budget basement refresh. Another popular possibility for fixing up a basement is to convert it into a functional studio, workshop or utility space. Many homeowners find the basement is the perfect spot for laundry rooms, crafting areas or even just keeping tools readily available. These spaces can be range from simple to elaborate depending on how much you want to put into it. The advantages of having a basement are immense. Many homeowners find that even with a small budget and lot creativity, basements can provide space that can be used in a number of ways. At their best, they can also enhance charm, functionality and value.